As most of you will know children experience a huge range of emotions. As adults we love seeing kids happy and excited and we don’t mind watching them be silly or cheeky either but what we do find extremely difficult is seeing kids distressed, worried, anxious, sad, angry, scared and/or upset. We have to remember that learning about emotions is part of a child’s growth and development. Children have to learn how to process and cope with different emotions and feelings. To learn these really important skills, children rely on the adults around them to help. However, often when we witness our children experiencing these uncomfortable emotions, we find it hard to regulate our own emotional experiences which makes it difficult to support our children. The initial response from us as parents is that we just want to jump in and save them from this uncomfortable feeling, instead of helping them recognize and respond to these emotions appropriately. As children learn to manage their emotions and overcome everyday fears, worries and disappointments their confidence grows and it enables them to take on new challenges. Parents, carers and school staff play a crucial role in helping children develop their emotional regulation skills. It’s natural for all kids to worry at times, and because of personality and temperament differences, some may worry more than others. With the right support parents can help kids learn to manage stress and tackle everyday problems with ease. Children who can manage their emotions will develop a sense of confidence and optimism that will help them master life’s challenges, big and small. There are so many different ways to help our children learn how to cope with common childhood emotions but today I want to give you a few practical ideas to help your child cope with separation worries. We all have to leave our kids in the care of others at times and when our children are sad, clingy and emotional during these drop offs it is heartbreaking and can be an awful experience. I’m sure the thoughts of “I don’t want to leave them here”, “Should we just all have a day off school?” “What can I do to help?”, “What could have happened to cause this?” or “Am I a bad parent?” have crossed your mind. The feelings are totally overwhelming and the thoughts going through your mind are endless. If you relate to this then I hope these practical tips make a difference in your drop offs whether this be a friend’s house, school, kinder, childcare, grandparents’ house or anywhere really. Disclaimer: Please note that if your child is experiencing extreme separation anxiety then you do need to consult a child Psychologist. The ideas below are to support families dealing with the typical challenges of parenthood. • Explain to your child what will happen at drop off. Remember to let them know when you’ll be back, and where you’ll pick them up from. • Remember to involve the teacher/friend that will be looking after your child in the process as they will be left with your upset child. • Don’t hang around at school or prolong the goodbyes. • NEVER sneak out – make sure your child knows you have left. • Try to appear relaxed with a happy or calm expression. • Set up a reward chart in which your child works towards something special. Magic Heart: Magic Heart is warm, reassuring and filled with as much love as a mother’s hug. A beautiful tale about conquering anxieties, taking ownership of nerves and surviving the first day of school. The Invisible String: A powerful book teaching children that when you love someone you can be near or far. Small home-made hearts that you can slip into your child’s pockets when you send them off, so they can carry a tangible bit of love and comfort while they’re away. Sew a tiny little heart button onto your child’s clothes – this can be as subtle as in their pocket or on their sleeve as long as your child knows where to find it. Teach your child to give the button a little squeeze or hug if they miss you and when they do, to remember that you love them all the time. 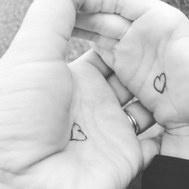 Alternatively, you can also draw a heart on your hand and your child’s hand and let them know that when they’re feeling worried, they can press the little heart as a button. Encourage your child to choose one of their special toys that they would like you to hold onto during the day and you as parent/caregiver do the same. Find something small and special that will remind your child of your relationship. Something that they can keep in their pocket to touch or look at when they do feel a little sad/worried. Just before you say your goodbye exchange toys with your child. Children often have so much going on in their little minds and once the worried thoughts start it all seems to spiral out of control. I suggest giving your child a little zip bag that they can keep near them or even on them. Whenever they start having a worried thought then encourage them to write it down or draw something – getting it out of their head and leaving it in the special bag so that as soon as you (parent/carer) pick them up you can discuss the things that they were worried about during the day. This is an opportunity for you to help your child process, rephrase and cope with the thoughts and feelings that overwhelm them. Spend some time with your child creating their very own personalized Worry Monster – all you will need is some pipe cleaners, a tissue box, plain paper and textas and you can create something very special together. Once complete encourage your child to write or draw their worry on a piece of paper. When they have identified their worry then they can let it go by feeding it to the Worry Monster. 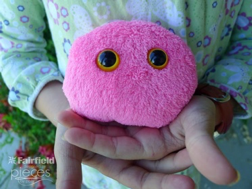 If you prefer to have something that your child can take along with them then you can make a Worry Pet. Worry Pets are small enough to fit in a pocket. They are made with soft snuggly fabric and poly-pellets inside providing comforting sensory input and something to rub between worried fingers. Create a little character with your child. 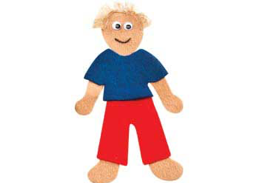 I recommend using felt (can be purchased at Spotlight) and cutting out a person (small enough to fit in your child’s pocket). On the back of the character you created write a few phrases that as a parent/carer you would say to your child when they are upset or worried. Encourage them to keep this character in their pocket and to pull it out and read the phrases when they start feeling a little sad or worried. The Little Wuppy® – a sausage dog worry puppy – has been designed as an aid to help ease children’s worries and to comfort them. Children can talk to it, hold it, pop it in their pocket or bag, place it under their pillow, keep it in a special place, or use it in any way their imagination takes them. The colours used are neutral, and the simplistic shape/design was chosen to avoid overwhelming an already anxious child. The luxurious minky fabric that backs the puppy is soft to touch, and makes the Little Wuppy® perfect for cuddling. Available to adopt online at Building Blocks Therapy or instore. I love using worry stones with older children as it’s a “tool” that doesn’t make them look different. Never ever do we want to make children uncomfortable with the “tools” we suggest for them to try to help them overcome these uncomfortable feelings. Children can use any stone (a small smooth rock is recommended) or they can make their own (see below). When worried, encourage your child to label what they are feeling (even if they do it quietly and internally) and then rub or touch the stone whilst doing some deep breathing exercises to calm their body and ease their worries so they can continue to participate in daily school/community/home activities. Using a permanent marker write a safe “cool down” strategy on each ice cube (these can be purchased on eBay) to remind your child of practical strategies they can implement when feeling overwhelmed. For example: count to ten, walk away, talk to a friend, take three deep breaths, etc. Encourage your child to keep their cubes in a jar somewhere safe where they can access it should they need. I hope you found these strategies practical. They are only a glimpse into some of the tools we use in Occupational Therapy. Please remember that it is really important to talk to your children about emotions. Just giving them a tangible object alone won’t help them manage their uncomfortable feelings but it’s a start to help them manage their separation worries. If your child is having a lot of emotional regulation challenges, please make sure you speak to a Psychologist or call us at Building Blocks Therapy (03) 9404 0338 and we will be able to direct you to services in our community that can support you and your family.